A nerve fiber, either in peripheral or in central nervous system carries nerve impulse towards destination. This impulse must reach the destination to the full extent with full velocity without being dissociated in the surrounding tissue. For this, the nerve fiber needs insulation (nonconductive coating). This insulation is formed by formation of sheath around the fiber, known as myelin sheath. In the nervous system, only the supporting cells are available to form this myelin sheath. In peripheral nervous system, the Schwann cells and in central nervous system, the oligodendrocytes take part in formation of myelin sheath.In peripheral nervous system, many Schwann cells come in relation to the length of a single nerve fiber in a row. These many Schwann cells are invaginated by a single nerve fiber. Due to invagination, Schwann cell give rise to formation of mesoaxon. Now the Schwann cell rotates around axon in a spiral fashion. The mesoaxon turn around several times around the fiber, thus squeezing out the cytoplasm at the periphery of Schwann cell. 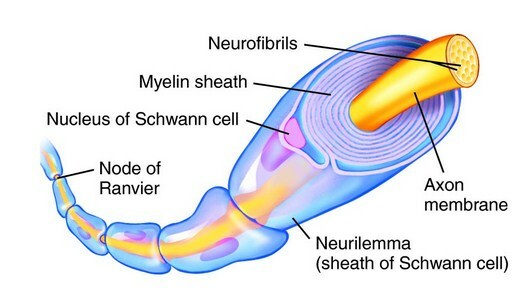 The turns of cell membrane of Schwann cell around nerve fiber form the myelin sheath (Fig. 1.18A). The multiple layered membranous sheath is white in color due to presence of white lipid– protein. More peripherally rim of cytoplasm of Schwann cell form an additional sheath which is known as Schwann cell sheath or neurilemmal sheath. Intermittent gap between the segments of myelin sheath formed by adjacent Schwann cells is known as nodes of Ranvier. An unit of sheath formed by a single Schwann cell, in between nodes of Ranvier is known as internode. Myelin sheath of central nervous system is formed by oligodendrocytes. But it is important to note following important points at this stage. It is not the whole cell, but only the processes of oligodendrocyte take part in formation of myelin sheath. Many processes of one oligodendrocyte take part in the formation of myelin sheath of many nerve fibers. Again processes of many oligodendrocytes take part in formation of myelin sheath of single nerve fiber. Myelin sheath helps in conduction of impulse through nerve fiber to the full extent and with full velocity to the destination. Thus myelin sheath prevents dissociation of impulse to the surrounding tissue. It acts as a support to the nerve fiber. It prevents ionic interchange between the cytoplasm of nerve fiber and the surrounding tissue.